A Trumbo reunion held in 1906, a few years later than the one described in this 1904 article. The Trumbo reunion was held at Glen Park. Thursday, June 25th, was the day. The Trumbos, large and small, old and young, gathered at their annual picnic. The place of meeting was Glen Park. About seventy-five went up on the morning train and later in the day a number more drove up. The afternoon train brought in another bunch of about fifteen or twenty. Trumbo Reunion, Meeting at 2:30 p. m.
Opening by Gualano orchestra – Two selections. Pres. Elias Trumbo opens meeting. Miss Dora Trumbo reads minutes prepared by Mrs. Parr, secretary, she (Mrs. Parr) being absent. Election of officers – Same officers retained. Address by Mr. Trumbo, of Pontiac. History of Trumbo family from 1774 to 1904. History sketch by Jesse Greene, read by Miss Trumbo of Pontiac. Speaking by Mrs. Wm. Long. Recitation by Miss Trumbo, of Pontiac. 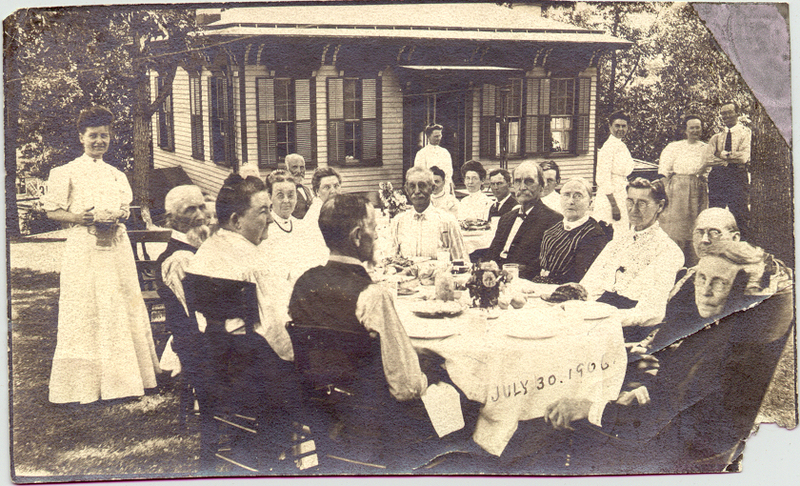 Those present from Ottawa were: Mr. and Mrs. Jesse Grove, Mr. and Mrs. George Pitzer, Barbara Jackson, Mr. and Mrs. George D. Sleuder, Mr. and Mrs. E. T. Strawn, Mr. and Mrs. G. W. Strawn, Florence Strawn, Mr. and Mrs. J. F. Trumbo, Mr. and Mrs. C. G. Deenis, Elias Trumbo, Mr. and Mrs. Sleuder, Mr. and Mrs. J. W. Gay, Strawn Gay, Isabelle Gay, Dorothy Gay, Charles Bradford, Jesse Grove, Lucy Grove, Helen Trumbo, Mr. and Mrs. E. F. Bradford, Rebecca Bradford, Mrs. Frank Shaver, Irene Shaver, Glen Shaver, Ruth Carpenter, Mrs. B. F. Trumbo, Mrs. C. L. Douglas, Josephine Trumbo, J. F. Trumbo, C. H. Tuttle, J. G. Shaver, Roy Deenis, Henry G. Hall, Roe Debolt, Mrs. H. E. Ruger, Mary Follett, Mae S. Knowles, W. H. Knowles, Frank Follett.